Gossip Stone: What’s the Deal with Zelda Wii U Link’s Mysterious Book? Nintendo hasn’t given us much in the way of new Zelda Wii U content aside from some promotional art and short clips we’ve all no doubt watched a hundred times over; we’ll have to wait until E3 before we get much of anything else. Those of us who’ve hungrily scrutinized the little we’ve been given probably noticed the curious notebook Link has on his person in a number of these promotions. With the mysterious book displayed so prominently in the most recently released artwork, and the Sheikah symbol that dons its cover appearing on Nintendo’s E3 website, I figure it’s about time for a little speculation. I’ve seen a number of theorists speculate that this book may be either a call-back to or an alternate version of the Book of Mudora from A Link to the Past. 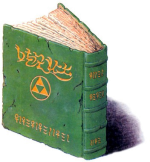 In that game, the book contained Hylian lore and was a guide that helped Link translate ancient Hylian Language (granting him access to temples and medallions). This is similar in function to the Ancient Sky Book in Twilight Princess which helps Link access the Sky Temple through the translation of its contents. What leads me to believe this mysterious notebook in Zelda Wii U isn’t the Book of Mudora is its design. The book in Zelda Wii U is dark grey and has a Sheikah eye displayed prominently on the center of it in a glowing gold design, whereas the Book of Mudora is green with a golden triforce on its cover. It wouldn’t be heinous to say the books could be related– the triforce one pertaining to the Royal Family of Hyrule and the other to the Sheikah tribe– but I should hope this new book would function in a larger way than just granting access to a temple since its been so deliberately brought to our attention by Nintendo. 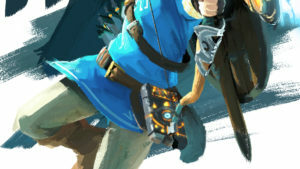 Interestingly enough with the Ancient Sky Book, it’s given to Link by Impaz, who is a Sheikah, so there could be a possible connection there. The symbol on the book’s face kind of resembles an eye if you really push-it, but there isn’t much else binding them (get it, binding?). In an effort to relate as many books in the series to this new one, the Guard Notebook from Phantom Hourglass that a Ho Ho tribesman finds in the ocean and is used in a trading sequence also has a golden symbol on its cover resembling the Sheikah eye. I suppose knowing where in the timeline Zelda Wii U falls would help solidify one book as being closely related to it. 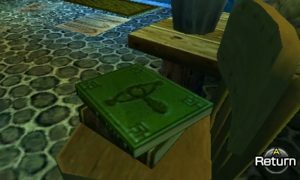 Among the similar looking books appearing throughout the series are these rather unimportant green books in Ocarina of Time that appear in Impa’s house, the Lakeside Laboratory, and Dampey’s house. They sit in the background really, but they have a legitimate Sheikah eye donning them. Seeing as Ocarina of Time is probably the most focused on Sheikah culture with the inclusion of Sheik, these books are of great interest in this case. Two appear in Kakariko Village, which was once a Sheikah settlement. The one at the Lakeside is puzzling though. Either way if the book in Zelda Wii U is related to these, it begs the questions of whether Link is the only one in possession of such a book or if by chance there is more than one copy. Because we still don’t know very much about Zelda Wii U, it would be very difficult to place it in the Zelda timeline. However, if I had to pick a place I’d probably put it somewhere after Skyward Sword and before the timeline splits. Skyward Sword gives Impa a crucial role in the game’s plot, and establishes that the Sheikah were devoted warriors for Hylia. We haven’t explored the Surface enough yet, but I’m willing to bet there’s a Sheikah tribe somewhere down there slowly expanding. The Sheikah don’t make an appearance in The Minish Cap or Four Swords, so the next time we see them following Skyward Sword is in Ocarina of Time where it’s clear the Sheikah tribe is on the downswing. But we’ve heard a lot about their generations of service to the Royal Family, so I’d assume that’s happening in the time between Skyward Sword and Ocarina of Time, and the upcoming game takes place during the Sheikah’s Golden Age. In relation to the book, Gaepora tells Link that he had read texts referring to the Surface, he’s even holding a green book with golden writing on it in his official art, so we know that certain texts have been passed down to important individuals since the Era of the Goddess Hylia. If this tradition is continued, the Sheikah having or later creating a significant book either imbued with their power or just outlining their history would make sense. And it would explain the appearance of those green books adorned with Sheikah eyes that later appear in Ocarina of Time. 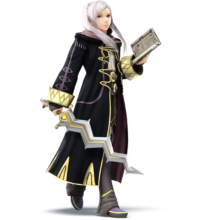 In the hopes of finding another possible function for this odd little book, I look to the Fire Emblem series, where mages are armed with tomes o’ plenty. 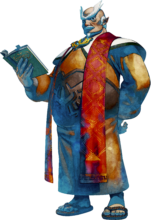 In Fire Emblem, tomes are spellbooks that “magic practitioners” read to invoke the power of a chosen spell. So this book Link possesses may function as a weapon in that sense, though Link is not typically a spellcaster, so it would seem a tad out of place for the series. Then again this game promises to deviate from the norm. A number of Fire Emblem games state that the books are written in an ancient language, which fits the usual description of books in Zelda being written in or aiding in the translation of ancient languages. In some games, the Fire Emblem tomes are even centered around a “Trinity of Magic” containing the types Anima, Dark, and Light. We know the Zelda series has the triforce– wisdom, courage, and power– so if this new book is taking a page from Fire Emblem this also supports the idea that there may be more than one. I’d like to examine what we know about the Sheikah, especially those appearing in the unified timeline, for the sake of speculation on what may be in store for us in Zelda Wii U. Impa in Skyward Sword displays impressive magical abilities and an ability to live for long stretches of time (whether that was influenced by the Goddess’ power is undetermined, though); these magic abilities can make the spellbook idea more plausible. Then in Ocarina of Time, though the Sheikah are nearly wiped out after fighting in the Hyrulean Civil War, we get a lot of content related to them. First, we’ve got another Impa. Then we get Sheik, the Lens of Truth, Gossip Stones, and the Mask of Truth. Sheik confirms that there are male Sheikah, even though we’ve yet to see one, because the disguise wouldn’t make sense if there weren’t other males. I think it would be really cool if it turned out Link was a Sheikah, but it doesn’t make sense in the context of the legends of the hero. The Lens of Truth and Mask of Truth show us that the Sheikah can craft magical objects, so there’s a good chance this book Link has in Zelda Wii U was given to him directly from someone in the Sheikah tribe or from someone in the Royal Family to whom it may have been passed down. In accordance with the Mask of Truth’s allowing Link to gather secrets from Gossip Stones, this book could have a similar function and would then fit within the realm of translation texts we’ve seen throughout the series. There is some question as to whether or not the “artifact,” as some have dubbed it, is even a book. It’s first appearance seemed to indicate that it was, because its details weren’t easy to discern. However in the new artwork it’s depicted more clearly, and the bottom edge of it doesn’t look like a tradition book. It’s side binding still looks like a book, but the bottom almost indicated that the outside is just a casing for something different entirely. I haven’t the slightest idea what that something could be, but if it isn’t a book then it must be something else that fits into the culture of the Sheikah in a significant way. 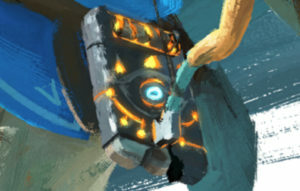 It’s way too early to be sure of anything pertaining to this “book,” but it and the recent emphases on the Sheikah eye indicates that this upcoming game will put more focus on the Sheikah race. There are endless possibilities here; the game could even take place during or shortly after the Hyrulean Civil War which would be amazing because we’d finally be delving into a piece of Zelda history that hasn’t been deeply fleshed out. In any case, this book has got me very hyped for Zelda Wii U, and I cannot wait for E3. Whatever its significance, I’m sure that this book and Zelda Wii U on the whole will be well worth its wait. What do you think this strange book’s function is? Do you even think it’s a book? What kind of role do you hope the Sheikah will play in Zelda Wii U? Share your thoughts on the subject in the comments below!